Coming off a two-week east coast trip, you’d think that the weather here in Chicago would be similar to what I experienced. Instead, I’m still somehow adjusting to a 30 degree temperature change. My last day in Boston was 80 degrees, my last day in Washington DC was 70 degrees and this weekend, we had a 10 minute blizzard in Chicago. Yes, snow in October! It's not unheard of but not usually this early. 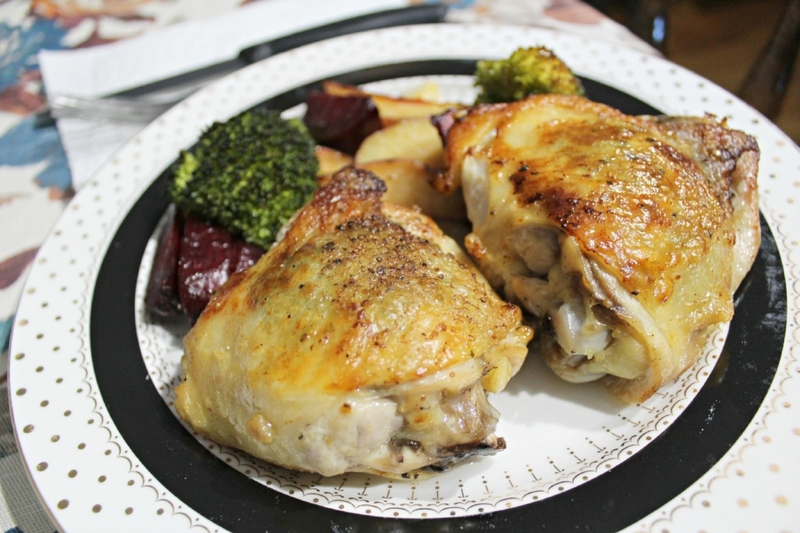 With that said, comforting dinners have been front of mind lately and nothing says cozy fall dinner like a roast chicken. Except, who has time for a whole roasted chicken on weeknights and more important, who wants to carve it? Not me, that’s for sure. Instead, for quick(er) dinners, I love picking up a whole chicken cut up from the grocery store or bone-in chicken thighs, our favorite. Dark meat is much more flavorful than white meat and it's much friendlier since it doesn’t dry up as easy. Anyway, this dinner isn’t quick but it gives you the same experience of a whole roasted chicken with less labor and in less time. The flavors are incredible, especially with the skin-on chicken thighs and a few simple herbs pull it all together. I had intended for this recipe to come together in the cast-iron skillet but eight chicken thighs and this many veggies was way too much for one skillet to handle all on its own. Instead, if you prefer baking it all in the same dish, place the veggies onto the baking sheet first and top with the chicken thighs. Just make sure that your baking sheet can handle all that veggie and chicken goodness! 1 - Preheat the oven to 350 degrees. Mix the parsley, basil, and thyme together in a small bowl. Tuck the herb mixture under the skin of the chicken thighs and season them with salt and pepper. 2 - In a cast-iron skillet (or large ovenproof skillet), melt the butter over high heat. Add the chicken, skin-side down, and cook 6-8 minutes until the skin gets golden brown and crisp. Flip and sear the other side as well. 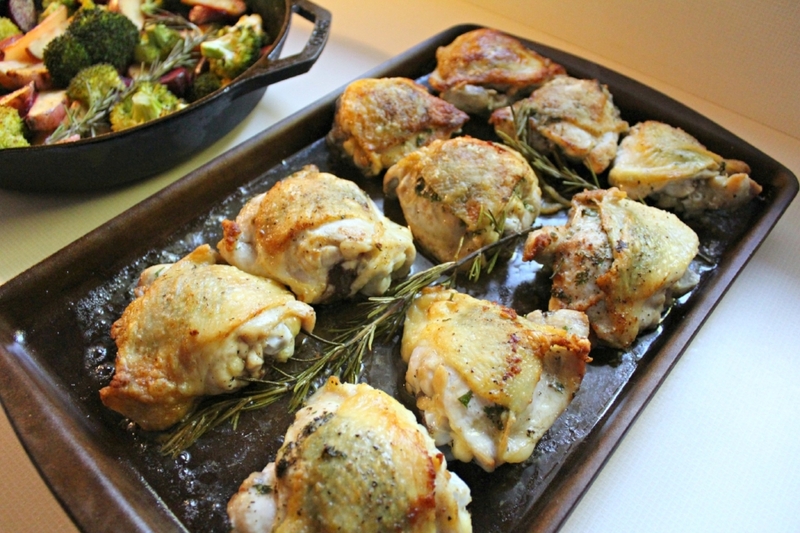 Remove the chicken thighs to a baking sheet and drain any excess fat in the skillet. 3 - Reduce the heat to medium. Add the beets, garlic, and potatoes. Let cook for 10-12 minutes until they begin to soften and the potatoes begin to get a little crispy. Add the broccoli and mix together. Season with salt and pepper. 4 - Place a sprig of rosemary in the veggies and one on each side of the chicken. Put the chicken on the bottom rack of the oven and the veggies in the cast-iron skillet on the top. Bake 25-30 minutes until the chicken is cooked through and the veggies are tender. Serve.